– Orrin H. Pilkey, William J. Neal, James Andrew Graham Cooper and Joseph T. Kelley. Orrin H. Pilkey is James B. Duke Professor Emeritus of Geology at the Nicholas School of the Environment at Duke University, and Founder and Director Emeritus of the Program for the Study of Developed Shorelines, based at Western Carolina University. William J. Neal , is Professor Emeritus of Geology, Department of Geology, at Grand Valley State University, Allendale, MI. James Andrew Graham Cooper, PhD, is Professor of Coastal Studies, at the University of Ulster. Joseph T. Kelley is Professor of Geology and Oceanography, at Lehigh University. Illustrated throughout with color photographs, maps, and graphics,”The World’s Beaches” explores one of the planet’s most dynamic environments, from tourist beaches to Arctic beaches strewn with ice chunks to steaming hot tropical shores…This fascinating, comprehensive guide also considers the future of beaches, and explains how extensively people have affected them, from coastal engineering to pollution, oil spills, and rising sea levels.” —Guardian, Culture, Book Review. “The World’s Beaches: A Global Guide to the Science of the Shoreline,” By Orrin H. Pilkey, William J. Neal, James Andrew Graham Cooper and Joseph T. Kelley. Best Sellers: Geology, March 1, 2012. —Library Journals list of Best Sellers in Geology, Book Review. 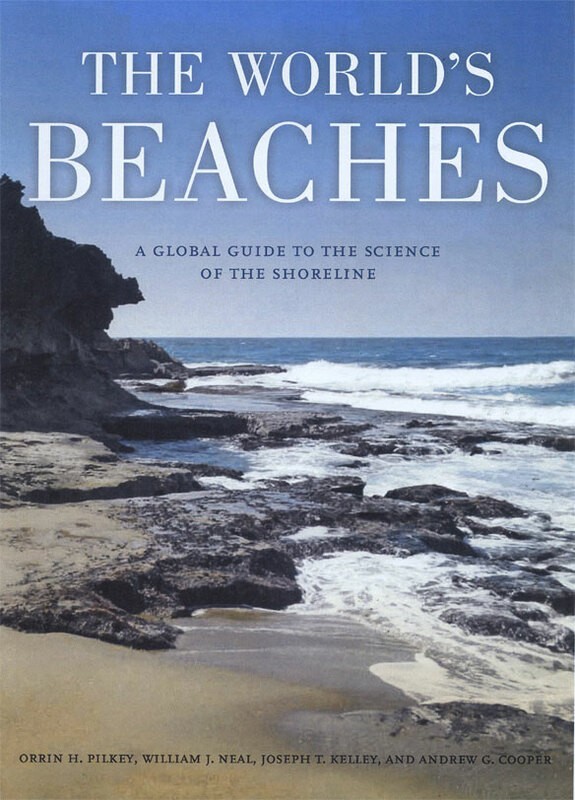 The World’s Beaches, A Global Guide to the Science of the Shoreline, by Orrin H. Pilkey, William J. Neal, Joseph T. Kelley, and J. Andrew G. Cooper. When will we ever learn the lessons of hurricanes? A Special to CNN. Dr. Pilkey, professor emeritus of Geology and of Earth and Ocean Sciences at Duke University, is unusual in his willingness to advocate for changes in policies that affect the environment. “Scientists, in my view, have a responsibility to spread the word,” he told Kirkus. While the book may appear academic to the everyday reader, Pilkey warns that beaches remain one of the best indicators of things to come with global warming.